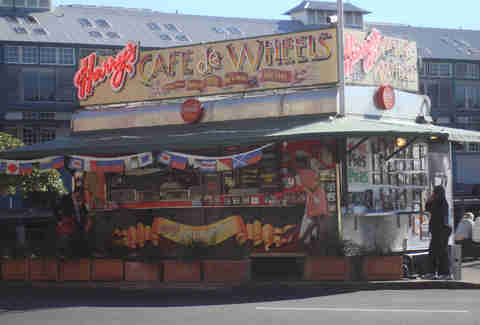 Cowper Wharf Roadway & Brougham Street Harry’s may not be a restaurant, strictly speaking, but this iconic cart in Woolloomooloo is an institution that's been dishing out pies near the naval dockyard since 1945, and has since opened up several more locations. Order the signature pie, the Tiger: it's a beef pie topped with mashed potato and smothered with mushy peas and gravy, and it's glorious. The food cart also serves pasties, sausage rolls, and hot dogs (which were introduced in the 1970s for American sailors). Jones Bay Wharf, 21 Pirrama Rd Situated next to the Jones Bay Wharf, Flying Fish features everything you’d want when you’re on the hunt for seafood. The alfresco setting, serious sashimi bar, and oyster selection (your choice of five regions from the South Coast of NSW) are some of the city’s best. If you want a cheaper way to enjoy waterfront views and fresh seafood, though, check out Doyles on the Wharf for a more fried-focused takeaway shop and bar. 7A, 2 Huntley St It’s a bit of a trek to this coffee-centric weekend spot, but the Grounds of Alexandria is worth the trip (and the wait). 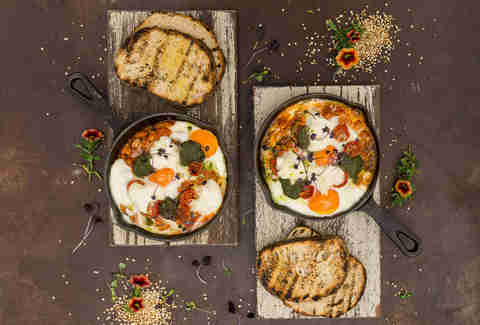 The ambitious coffee roaster/café/bakery/sustainable garden is built into an industrial warehouse that overflows into a courtyard, and while it's invariably brimming with people, you’ll forget how hangry you were with a fork full of lamb ragout pappardelle or a breakfast burger with a side of polenta chips. Or skip the long lines altogether and instead grab food at one of the food stalls where, lest we forget, is a donut cart. Oh yes, there’s a donut cart. 248 Palmer St This Darlinghurst eatery skips the pomp found in some of the newer pizzerias around town, focusing instead on its bubbling Neapolitan pies. The local favorite is a two-in-one special, which includes half a Margherita pie and half a calzone filled with ham and ricotta -- it’s not an abomination to pizza, we swear. 61 Albion Street Brekky is important in Oz, in large part because it begins with your first cup of Joe -- luckily for you, Reuben Hills roasts its own beans and has a killer breakfast menu to boot. The coffee roastery is actually located above the café, which you can catch a glimpse of by checking out one of their tasting sessions at 10am every Saturday... or by just looking up. 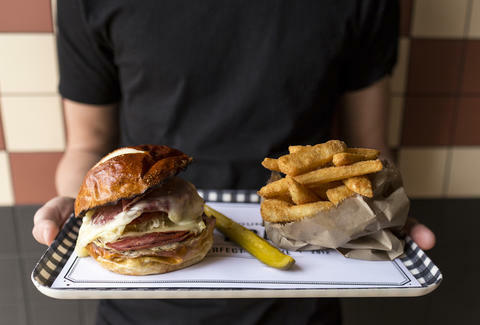 Order the baleada (a tortilla filled with pinto, smoked tetilla, salsa, cactus, scram, and Mex truffle) or the NOT Reuben (wagyu salt brisket, pickled slaw, manchego, and horseradish mayo on rye), then top it all off with a salted caramel shake. 11 Bridge St Neil Perry’s longstanding establishment hasn’t lost any of its luster over the years (which included a move to Bridge St). This scene-y restaurant is more SoHo than Sydney with its speakeasy vibe and jazz soundtrack, but all the hype is (rightfully) focused on the menu. Like many Sydney restaurants, expect classic Aussie fare with an upscale Asian twist -- and by upscale, we mean Blue Mountains wagyu grilled with wasabi and pickled chrysanthemum, and prawn mousse in squid ink sauce. Luckily, it’s dark enough to mask your confusion while trying to impress your date with your order. 6 Mary St, Newtown Mary’s in Newtown makes your crippling indecision over whether to order fried chicken or a burger very easy: the correct answer is, both. Though the dingy, death metal bar boasts an impressive craft beer list, the popularity of its burgers has led the team to open up a takeout spot in CBD, where you can get your hands on an exclusive breakfast burger made with a pork-shoulder sausage patty. 169 Dolphin St Sydney’s many waterfront establishments make it tricky to single out a spot for outdoor dining, but there’s no match for Coogee Pavilion’s rooftop and its 270-degree beach views. Enjoy lobster rolls, wood-fired pizza, an oyster bar, and a juice cart downstairs, but head up to the rooftop for a boozy (and sea-breezy) afternoon overlooking Coogee Beach. 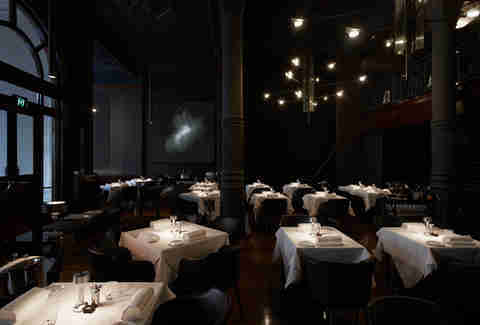 The menu is smaller upstairs, but features tasty snacks like blistered Padron peppers and zhoug lamb chops. 65 Ocean St Though it’s tucked away in a garden along the leafy streets of Woollahra, Chiswick’s lively vibe and open-air dining room are the perfect backdrop for a boozy afternoon of bloody marys-turned-early dinner. The menu is seasonal and focuses on locally grown fare, including a massive order of woodfire-roasted lamb shoulder from Chef Matt Moran’s family property just outside of Bathurst. Where is it? Quay is hands down Sydney’s most celebrated restaurant, and for good reason: the iconic dining room overlooks Sydney Harbor with uninterrupted views of the bridge and Opera House. It's consistently in the top half of Australia’s best restaurants lists and, until recently, also earned a place on the San Pellegrino World’s Best Restaurants list (it dropped from 48 in 2013 to 58). 31 Alfred St An alternative to Quay is the quintessential Café Sydney, which sits atop the roof of the Customs House and touts an unmatched view of Circular Quay and the Sydney Harbor. Akin to Quay in price, Café Sydney is typically a local haunt for business executives and beautiful people who actually own some of those yachts out on the water. That said, the seafood-focused menu and extraordinary backdrop are worth one pricy meal. 271 Bondi Rd "Stuffed Beaver" isn’t even the best name at this Canadian dive in Bondi: the menu features some of the Great White North’s biggest exports, including the Pam Anderson (dubbed "Canada’s sloppiest beaver") and the John Candy Combo (beef patty, fried jack cheese, bacon, pickles, and "Canadian as f@#K!"). 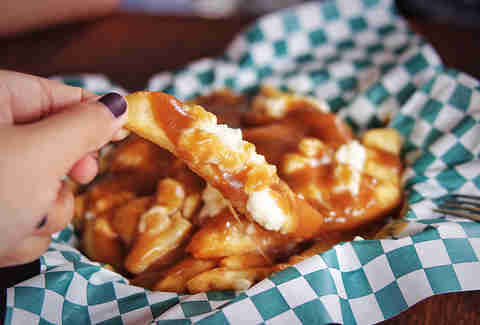 It also wouldn’t be a Canuck hangout without a full poutine menu. 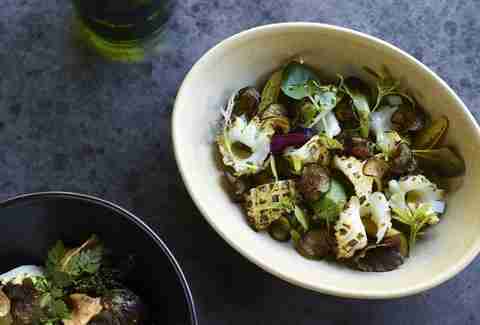 34 Redfern St This offbeat, innovative Korean spot satisfies both vegetarians and carnivores alike. Inquire about the veggie menu, and you'll end up with flavorful items like a potato pancake with shiso and charred eggplant with mung bean jelly and zucchini namul.